You’ve closed the sale, arranged transport with a moving company and are now ready to move into your new home. But before you settle in for your first night there are a few things you need to deal with. 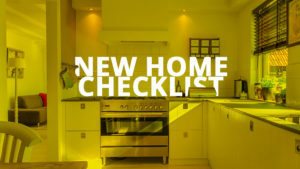 To make sure your new home will be safe and comfortable follow this checklist and you’ll have a much smoother beginning. Being handed the keys to your home is the moment we all look forward to but they won’t be the same keys for long. One of the first things you should do is change all the locks or have them rekeyed. It’s impossible to know how many copies the previous owners might have given out to babysitters, friends or relatives. Ensure that your home is safe by having the locks changed so there’ll be no unexpected visitors. Once you closed the sale you should make at least three copies of your housing documents. Store the originals in a fire-proof safe in your home, another with your financial institution and a third can be left with home insurance providers while they set up your coverage. Make your home your own by branding it. The previous owners may have had their name or just the housing number on the front door; personalize it with your own. The same can go for your mailbox which allows you to mark your territory better. If your home has a carpet, swimming pool or gym you should get a deep-clean before moving in. Contact professional service providers to perform a deep clean of your home, you should also consider hiring HVAC contractors to inspect your heating and air-conditioning systems. You’ll need to inform a lot of people about your change of address. This can include your boss, financial institution, insurance provider, loan company and any other businesses you frequently make payments to. If you have children you’ll need to inform the local schools that you’ll be moving to the area. This will give them time to prepare any paperwork to allow for the transition. If your new home doesn’t already have a smoke alarm and CO2 detector you should have them installed immediately. As many as 150 deaths from carbon monoxide poisoning are reported every year so make sure you have one installed that is working properly. Smoke detectors may seem obvious but you’d be surprised how many deaths a year result from faulty detectors or failure to check batteries. Again, this might seem obvious but it’s something many people overlook. There are many things you need to buy for a new home and fire extinguishers should be near the top of the list. Have one for every level of the home and make sure every member of the family knows where they are. Lastly, don’t forget to be friendly and greet your new neighbors. A good impression from the start will make it far easier to settle into a new location. Call on your neighbors and ask about any social gatherings you can take part in. if they have any children ask about play dates or activities in the area. Moving into a new home is an exciting time and by planning right you can make the transition smooth and effortless.